volleyball gear (shoes, shorts, kneepads) and water bottle. Water coolers will be provided in order to fill up water bottles. Will there be supervision of campers? Campers will have camp counselors with them at all times; this includes during skill sessions, and meal times. Where do I go to drop off/pick up my camper? West entrance of Cintas Center, located on Webster Ave. If your camper is coming from out of town and needs picked up from the airport or bus station, please contact the Camp Director to make arrangements. Will there be any camp apparel available? Yes. There will be a camp spirit store open that will allow campers to purchase Xavier Volleyball gear. Any parents sending two or more children will receive 15% discount off of the cumulative fee for all children. Will there be a trainer on site? Yes, there will be a trainer on site; however, if a camper needs to be taped for any reason (ankle, wrist, etc.) the camper must bring their OWN tape. Also, if a camper needs medication, they must bring their own. The trainer will hold on to the medicine, but the trainer will NOT administer new medication to the camper. 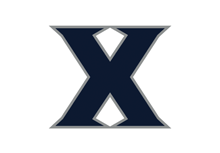 ​(limited only by number, age, and/or grade level) and are hosted at Xavier University facilities.